Hero, you have an awesome daddy. Albeit a crazy one. Some of my friends call your dad Captain Awesome, and it's not hard to see why. He wakes up at 4:30 in the morning to do his 100-miler training. Short runs, he says. They're around 8 kilometers long. He comes back home in time to see you wake up. 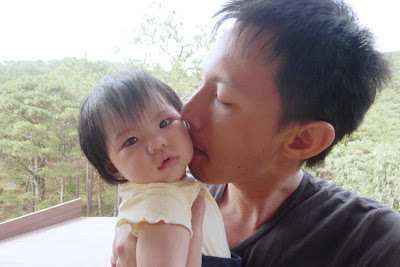 You somehow know that mornings are meant for playing with daddy. So you smile and let him pick you up. He changes you from your frogsuit pajamas and into your onesie. Changes your diaper too. You don't mind at all that mommy is still asleep. Your daddy then dives into the morning rush traffic to clock in at 8:30am. By the afternoon, I'm sure he just couldn't wait to come home. And it's back onto the traffic to see you just after you've had your dinner. Before we had you, we'd have late meals. But now we're done eating by 7:30 just so he could have a little over an hour of play before you get cranky and sleepy. He plays with you, makes silly voices to make your toys "talk" to you. He crawls on the floor with you. Concocts adventures with pillows and blankets for you. It amazes me how he can still manage to. While I stand already weary and I work at home. On weekends he'll do his longer training runs. Up to 38 kilometers, I think (and I think on some days he has to do more). It's insane, isn't it? It's almost doing a self-imposed marathon. He makes it home late morning and you're already awake, playing or just come from your bath. And he'll still play with you before he goes to take a rest. You don't even care if he's sweaty and kick your little legs in the air, begging to be carried. Sometimes you even cry when he doesn't. Then there are days when he doesn't get to rest at all (or barely). Because then he'll be helping mommy with her workshops. He'll carry the things, arrange the seats, take the photos and pack it all up again. Sometimes during the lessons he'll even remind mommy to teach or do things she'd otherwise forget. And after all that, he drives hurriedly home so we could play with you and cuddle with you (even if you don't really like cuddling). He's super. And you're lucky. And I've got a feeling you'll be running around and doing amazing things, just like your daddy. when your husband is out running and you're not there. Well, technically you are - somewhere there. But not quite. Unless of course you're the kind of wife who runs with her husband. I couldn't sleep tonight and I realized that I haven't written on this blog in ages. This would be a retrospect on the TNF100 that happened in Baguio City eons ago (aka last April). At the same time, some pondering by an insomniac brain brought about by a friend who let her husband go on his race with that fresh sense of worry. We were talking about that a couple of days ago. And I found myself becoming that "oh don't worry it's going to be fine" kind of character. The truth is though, you can't escape the worry. Even if it's just a training run early morning. He leaves. You hear rain. You go back to sleep but really, you're hoping that he's on his way back and doesn't catch a cold. Then you'd have major ultras that really boggle your mind with the amount of insanity. 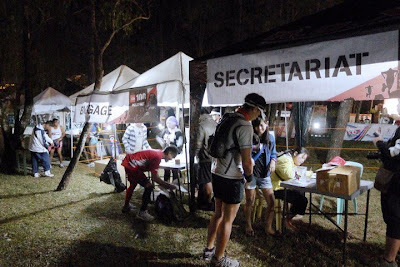 Like the Bataan Death March (though at least for this, I was part of the support crew following him around). And then the TNF100. 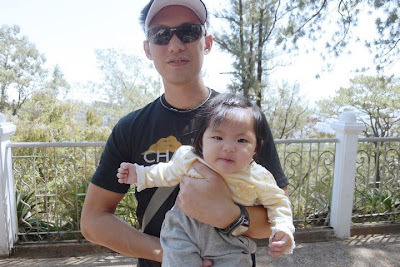 The great thing about the it was that we got to bring Hero up to Baguio with us. I mean, look at that little ball of cuteness. The hard thing about the TNF100 was... err, the TNF100. From the previous time we were up there, I knew it was hard. It was crazy. And crazy as crazy could, my crazy husband is doing the 100k. TRAIL. UP IN THE MOUNTAINS. The un-best part of it is, you're not there. With him. It's not like a city race. Or an ultra out of town. This was TNF. And it's one hundred effing kilometers. At ear-popping heights above sea level. Like, HELLO. Okay, so you're kind of used to this whole race thing anyway. You're sharing in the buzz and the excitement. And it's truly a happy moment. Until the gun start and they're off and you're not with him anymore. And you're left with just faith and trust that he listened to you when you repeatedly said things like "don't push yourself too hard" and "listen to your body" and "be safe". Translation in your head: PLEASE COME BACK IN ONE PIECE, GODDAMMIT. Having been with him in a number of races, knowing his pace, I would calculate how much distance he's probably covered. He has a phone, but I didn't want to bug him too often. He'd call or text to update and I'd think that hey, he's doing well. And then there's this super icky feeling. I'm not sure if you just become wired that way. When something in your gut tells you that something bad (or at least not right) is going to happen. And then he calls and says, "I don't think I can finish this". And you're half in denial and half relieved. Because for one thing, of course you'd want him to finish! All that work! While the other part of you wants to just scoop him up from wherever he is and give him a big hug - thank God it's over. That night, Chips made a decision to quit the race at KM70. He took shelter at an aid station, squeezed into a small tent with a couple of marshalls, and waited for daybreak before heading down the mountains. His phone battery went dead and during that time I think parts of my brain short-circuited because of the anxiety. Kind locals at a sari-sari store lent him a battery to use while we were working out his location. 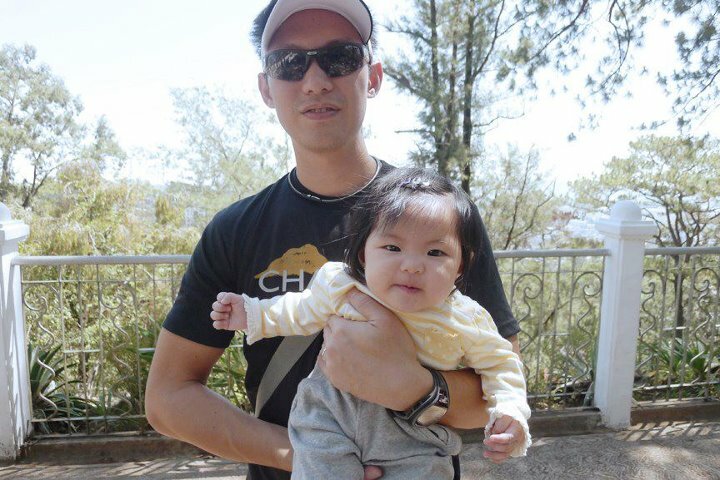 We picked him up along Kennon Road and hugging him all stinky, reeking of sweat and soil felt like the best thing ever. And I actually found myself saying, "you'll finish it next year". WHAT. YES. I want him to do it again next year. I will send him off again. Into a monster of a thing totally unknown to me. And we're going to finish it, yes we will. I really thought that this would be the first confirmed race for the year. In the last post, it's really the one that didn't have any disclaimer to it. Boy was I wrong. This is actually the hubby's SECOND race. See, I had thought that he was just doing support for the BDM 50K test run for his running buddy who'll be doing it for the first time. Nuh-uh. He raced it. And despite coming from the running enemy that is the holiday season, he actually did pretty well. He placed 22nd, with an official time of 7:10:58. Official results can be seen HERE. Okay, back to the post at hand. The Condura Skyway Marathon which is hereby the second race for the year. 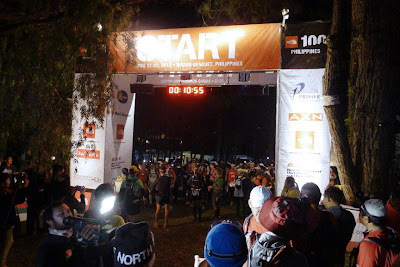 Unlike the past runs, this one was held at night. Why they did that, I don't know. Chips wasn't too fond of it - he just wanted to run it because he wanted to get back into shape. For one thing, there's no majestic sunrise. Therefore, no view, no colors, no nothing. Just bouncing reflectors and camera flashes. It basically stripped him out of the beauty he so loved to see when running. I would be able to relate - at least on an aesthetic viewpoint, how would you get that awesome finish photo? Anyway, he intented to just "run it" and not "race it". But ended up racing it anyway. It's not a PR, but considering that he came from a 4-day seminar and had little sleep (enter playing with Hero), he's really proud of what he accomplished. Official Results can be viewed HERE. Unfortunately, he didn't get to plan his recovery as well (enter again playing with Hero) and he totally forgot to ice his muscles when he got home. But really, when you have a little one waiting for you, how could you remember? And can I just say, the medal is HUGE. It's as big (or even bigger) than Hero's head. That's Hero obviously not knowing what the hell is happening. LOL. It's been a long while since I posted here! Why? Well, Hero's here! 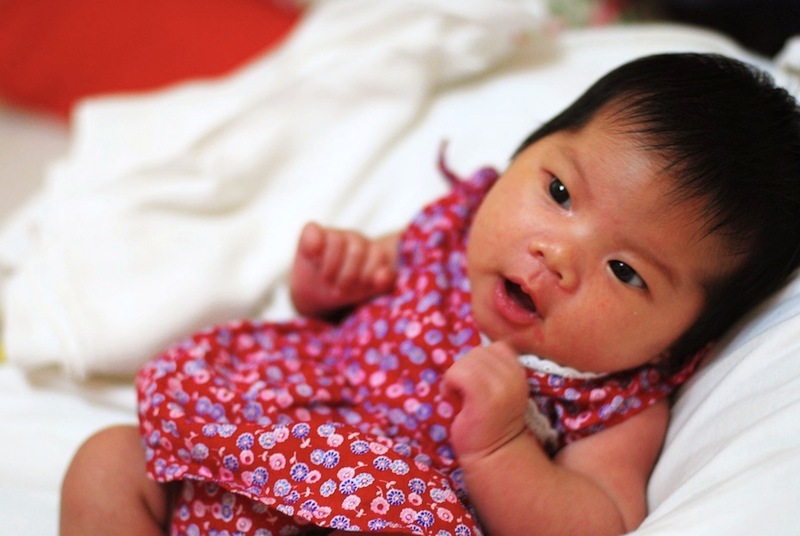 The past months have been a whirlwind of cuteness, eyebags and holiday fat. Chips is actually on this quest to get back into shape. But Hero is just so good at keeping him from going out to run (look at that face, who wouldn't want to stay in?). We're pretty excited for this year. Especially since Hero can be with me at the finish line once she's big enough. 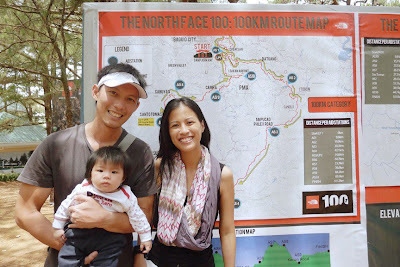 And that would just fall around this year's TNF100 - summer at Baguio with Hero, how fun is that?! I'm also really grateful that BR has published his planned races for 2012 - at least I'd have a reference of when Chips is going to be gone. 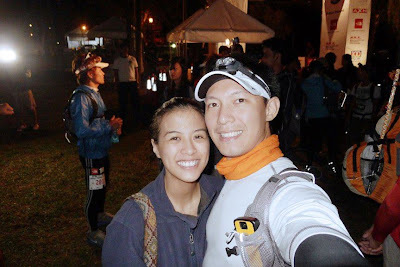 February 5, 2012—Condura Skyway Marathon, "Run for the Mangroves"
That basically takes care of half of the year. Though really, I never know when another race decides to show up. Like with a free race kit or something. Hero and I will just be ready with our finish line outfits (swimsuits too, for the Pagudpud run! ).